This weekend’s vacation achievement unlocked: we learned hot to use the shower-sauna! Electric showers, with all the fancy buttons and symbols are interesting but the ones in this flat didn’t seem very useful at first. However, after a bit of study yesterday, we are happy to report that we figured out how to make the water hot, something one might expect to be somewhat self-explanatory (sadly, no) and how to make the jets of steam rising from the floor act like more than intermittent volcanic exhalations. We are rather proud of ourselves. Of course, we’re mainly showering with cold simply because it’s so incredibly warm here. It’s been unbelievably balmy, and today it was nearly 80 degrees. It’s a little different to experience that kind of warmth in humidity, but the sea breezes kept coming, and there’s plenty of trees in this green and pleasant land, so we were mostly fine. After the slightly terrifying day we had in Amsterdam – with several trains and miles of walking and seeing so much artwork and architecture and riding in a cyclecab through insane traffic, littered with bikes and cars and buses at rush hour on a Friday – today we kept it simple and tooled around Delft. 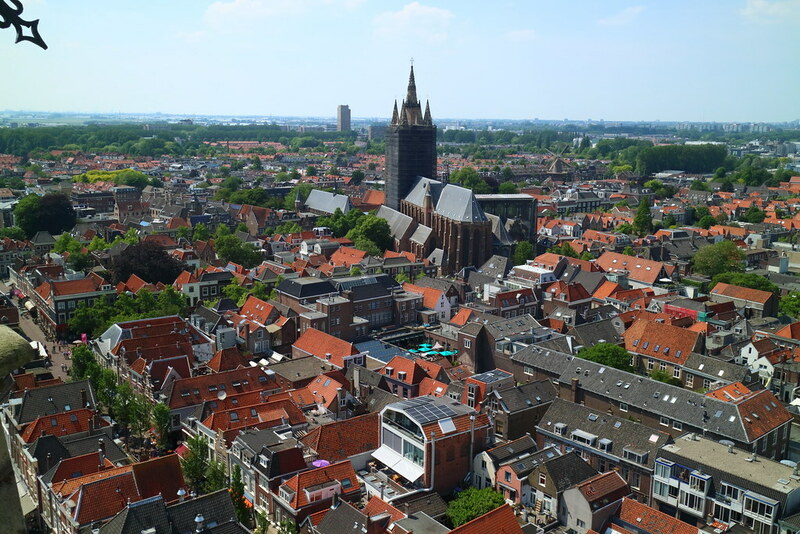 We visited Nieuwe Kerk, Oude Kerk, and people-watched, enjoying the vibrant outdoor weekend life of this busy little town. 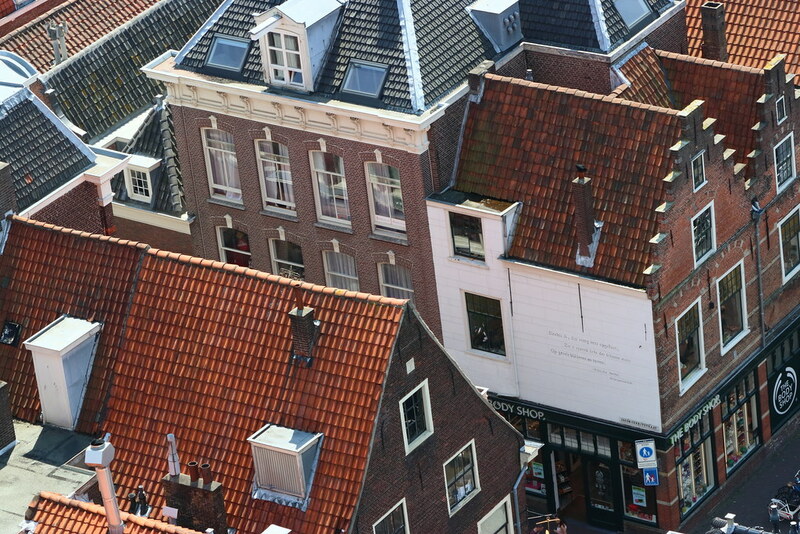 Delft’s “Marktplaats” is in the center of its medieval downtown, loosely bracketed by the oldest church in the town, on one end the “new” church, and opposite that their city hall. The market square hosts two weekly markets, the first on Thursday, with a huge flower market, the second on Saturday, with a vast antique/flea market. At both, fruit, veg, candy, clothes, household goods and sundries can be purchased. After a leisurely breakfast we began our day with Nieuwe Kerk. Nieuwe Kerk has two viewing galleries open to the public (there are a few other doors which are locked, on the long climb up to the top). So, of course, despite the rather warm day and the D. had to climb them. This resulted in some fabulous photos … but, as D. said when T. texted him to ask how it was going, “Terrifying. Coming down now.” The ledge is about 2 feet wide and the railing comes up to about 10 inches below D’s waist. 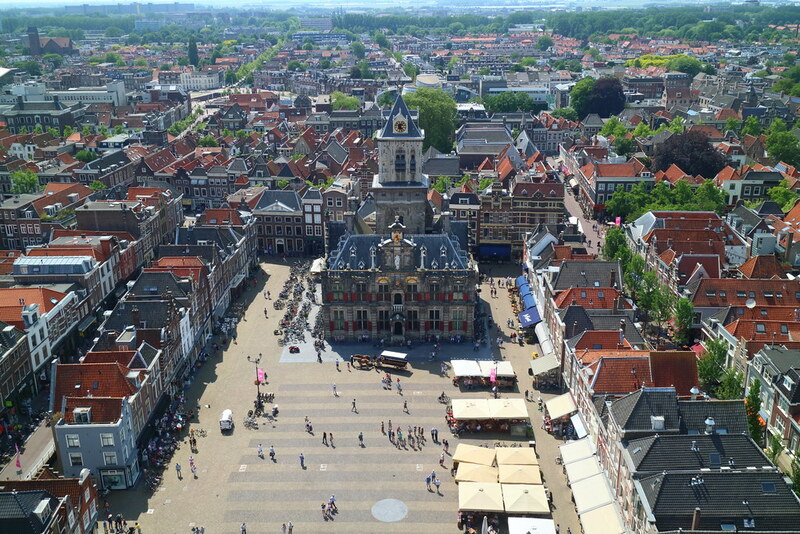 Fiddling with multiple cameras (yes, multiple: a Canon 80D, a Canon M3, 4 lenses, plus the cell phone because it does panoramas so well), in the breeze, at the top of one of the tallest churches in The Netherlands is a bit fraught, particularly when there are other visitors who want to get past. Was it worth it, to get a picture of the flat we’re staying in? 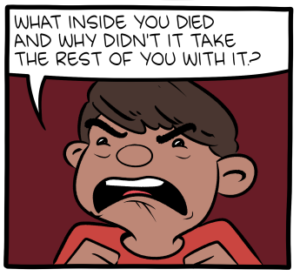 Perhaps. We’re staying in the pair of windows with the sheer curtains drawn, right in the middle of the photo below. 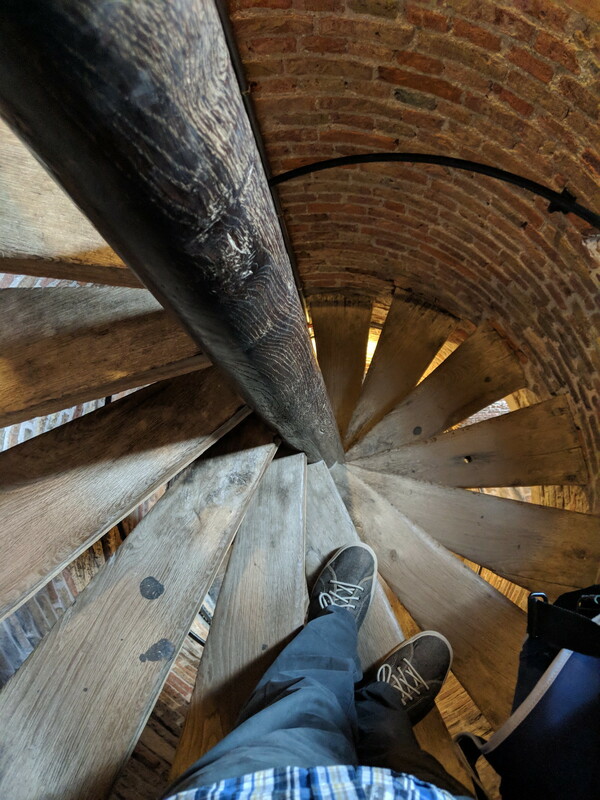 There are apparently 377 stairs to get to the very top, with about half of those being as nice and spacious as those pictured below. The rest are narrower. Passing your fellow tourists going in either direction is also not anything to want to go through again. The view is, of course, wonderful. Here’s the town hall, just across the town square from Nieuwe Kerk. 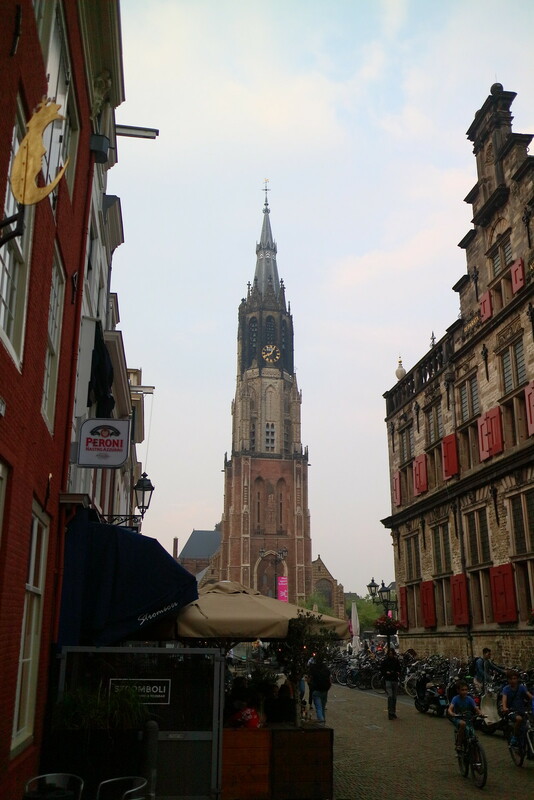 And, after visiting Nieuwe Kerk, we went to visit Oude Kerk. Thankfully, there doesn’t seem to be a publicly accessible gallery, so D. had to be content with photographing other things. 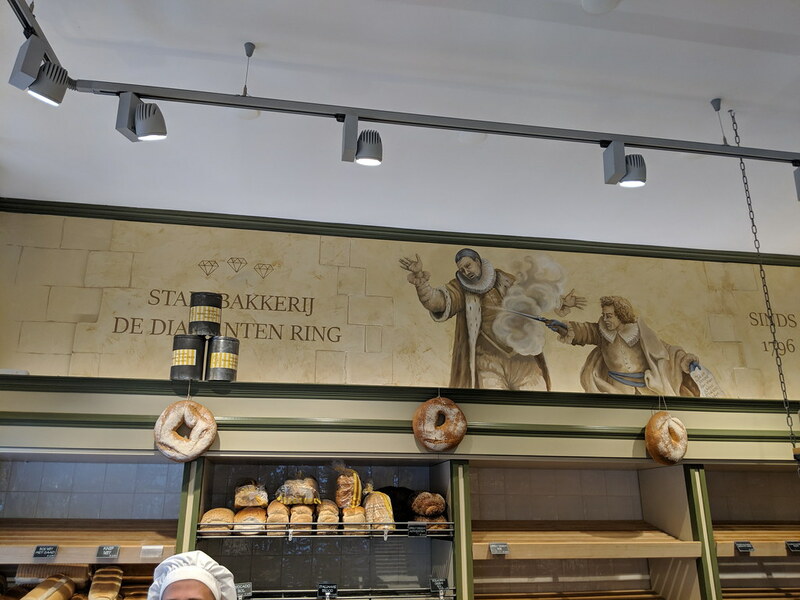 Tomorrow may involve riding a canal boat, going to several museums, and hopefully a return to the fabulous Stadsbakkerij de Diamanten Ring for more tasty treats (and, perhaps, to contemplate the mural telling us that William of Orange’s assassin slept here the night before he shot William.). We shall see. Our friend L leaves the day after tomorrow and our friend Thing-1 shows up that evening. We shall endeavor to take plenty of photos, of course (we’re up to 449 photos and a half dozen or so videos, since arriving late Wednesday night … so, 3 days of being tourists). After Thing-1 leaves we’ll make a point to spend time away from Delft (Gemert, with friend S and Wannepeerven & Gierthoorn with D & fam) because the Delft Fringe Festival begins, and it’s already lively enough, being so close to the pedestrian center in the marktplaats! Huzzah for hot water and exploring new burgs.